Fabled Tuscany has been greatly admired for its gorgeous landscape and elegant towns. It is a region that has served as a setting for many films—A Room With a View, Gladiator, Quantum of Solace, Hannibal and Under the Tuscan Sun. Filmmakers are said to love the light in Tuscany, and indeed, the region appears generally suffused with warm, gentle sunlight that lends a romanticizing air to all things. Tuscany's terrain is largely composed of rolling hills, flowery valleys, and golden wheat fields, as well as some of Italy's loveliest and best preserved forests. To the east of the region, you'll find the Apennine Mountains, "the backbone of Italy." To the west you'll find the Tyrrhenian coast, lined with festive resorts and several natural beaches. A warm Mediterranean climate pervades throughout, although up by the Apennines it is cooler and wetter. Tuscany gave birth to the first stirrings of civilization in Italy; it was here that the ancient Etruscan people established Etruria (Tyrrhenia) around 1000 BC. The Etruscans held sway over Italy and the Mediterranean from around 650 BC until 540 BC, when Carthage became a great Mediterranean power. By 500 BC, the weakened Etruscan civilization had been eclipsed by the Roman Republic. Rome later lost control of Tuscany, which came under the rule of the Lombards in 6th century, then the Franks in 8th century. Sometime in the 12th century, Tuscany lost cohesion and its cities became independent and often at war with each other. But following the rise of the Medici family in Florence, Tuscany was made into a principality. The Medicis oversaw the flowering of art and humanism in an era we now know as the Renaissance. The rule of the Medicis ended in 1737, and Tuscany came under the control of the Habsburg-Lorraine dynasty of Austria (with a brief period of occupation under the French Empire). After the Second War of Italian Independence in 1859, Tuscany was annexed into Italy. A rich agricultural region, Tuscany produces wheat and other cereal crops, olives and olive oil, and wine. Chianti, the world's oldest wine-growing district, is one of the loveliest parts of Tuscany and a popular destination for vacationers. The hilly Tuscan countryside is dotted with medieval structures as well as houses that blend in with the scenery in their traditional warm colors. The traditional architecture, mostly built with stone, is part of the charm of Tuscany. Tuscany has long been popular with foreigners. Florence, Siena, Pisa, Lucca and other historic towns here attract many tourists and expatriates-particularly British and Americans expats. Country homes, especially in central Tuscany, are in great demand and frequently hard to come by. 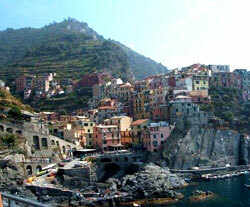 The fine villas and palazzi in the towns are much sought after as well. The coastline area along the Tyrrhenian Sea is also popular; affluent Romans and Florentines often flock to the lovely coastal towns for their summer holidays. A small but profoundly historic city, Florence was the cradle of the Renaissance and briefly the capital of Italy, from 1865 to 1870. With its many beautiful churches filled with art and elegant Renaissance-style palazzi, Florence is easily one of the most beautiful towns in the world. It is a serene, gracious city, a good place for walking leisurely with none of the rush and bad traffic found in the bigger cities of Italy. It is small enough that it is possible to walk from one famous sight to the other, from the central Duomo Cathedral to the elegant Palazzo Pitti to the enchanting Boboli Garden on the outskirts of the city. That Florence is so beautiful is undoubtedly due to the inspired patronage of the Medicis, the prominent banking family that held sway over Tuscany from the early 15th century until 1737. The Medicis were instrumental in ushering in the Renaissance era. They oversaw the construction of architectural marvels such as the Basilica of San Lorenzo, Santa Maria del Fiore (the Duomo), and Santa Maria Novella. The Medicis and other wealthy Florentines supported the work of Leonardo da Vinci, Michelangelo, Botticelli, Brunelleschi, Donatello, Fra Angelico and other illustrious artists. Many of these great painters' works now hang in the Uffizi Gallery including Botticelli's The Birth of Venus, Da Vinci's Annunciation, and Titian's Venus of Urbino. Michelangelo's famous statue of David stands in the Academy Gallery (Galleria dell-Accademia), along with other sculptural works by the great artist. More magnificent sculptures by Michelangelo are found in the Medici Chapels. Florence lies on the banks of the river Arno, which is spanned by several bridges, including the glorious Ponte Vecchio. The river has been known to overflow when there are strong rains, and massive flooding damaged some of the city's artistic treasures in 1966. (The Uffizzi Gallery is right next to the river.) Hence, the water level is now vigilantly monitored. Florence can get quite busy and crowded during the peak seasons, but still has plenty of breathing room thanks to its wide piazzas. The main disadvantage of its popularity as a tourist destination is that there are quite a few overpriced establishments. The plus side is that thanks to globalization as well as tourism, many of the people can speak English. Like most Italians, Florentines tend to be very warm and friendly. A few minutes outside Florence is the charming hilltop town of Fiesole. People come to the town to enjoy a spectacular panorama of Florence from the Piazza Mino. Fiesole may appear familiar to some cinephiles, as A Room With a View was filmed there. San Lorenzo, the historic centre of the city, is named for the early Renaissance-style church designed by Brunelleschi. San Lorenzo was the home parish of the Medicis, and houses many of the buildings they commissioned, including the Sagrestia Vecchia, the Laurenziana Library (with its staircase designed by Da Vinci), and the Medici Chapels (Michelangelo's first commission). The most prominent structure is the imposing Basilica di Santa Maria del Fiore (Duomo) with its stunning red-brick dome. Ambitiously engineered by Brunelleschi, the miraculous dome stands out as the most eye-catching landmark in Florence. The district is also known for the busy, sprawling San Lorenzo market occupying several streets around the parish church. The market specializes in leather goods, vintage and contemporary clothing, jewellery, and food and wine. The fashionable street of Via Tornabuoni garnered its cachet as far back as the 14th century, when the affluent Tornabuoni family built a palazzo here. The elegant avenue runs north to south, from Palazzo Antinori to Piazza Santa Trinita. The most illustrious Italian designers have boutiques along Via Tornabuoni or its side streets; Prada, Ferragamo, Hermès, Dolce & Gabbana, and Louis Vuitton are just some of the fashion brands that have stores here. Jutting out from the middle part of Via Tornabuoni is the Via delle Vigna Nuova, which runs to the 14th-century Palazzo Rucellai. The luxury stores of Armani, Gucci and Valentino are located around the stunning palace. Just off the fashionable shopping district and on the north side of the river Arno, this is the area housing the Ognissanti church, known for its stunning frescoes and the grave of Botticelli. The Piazza Ognissanti is where Florence's annual Antique Fair is held, drawing antique dealers and buyers worldwide. A hospital is conveniently located near the church. These streets are close to the river, between Ponte Vecchio and the central train station. Piazza di Santa Croce is a profoundly beautiful square, relaxing and peaceful and surrounded by splendid architecture. Casual football games are occasionally played here. On the square stands the Santa Croce church, a medieval Franciscan basilica. The church is especially notable for its funerary monuments to historic personages and great artists, including Galileo, Machiavelli, and Michelangelo. There is good shopping in the Santa Croce area, with interesting lesser-known boutiques. Leather goods are an especially good buy here, as the church runs a leather-working school. The National Central Library (built in the tenth century) is located in Santa Croce. The south side of town is Oltrarno, literally "other" - as in the other side of the bridge. Oltrarno has its own historic section, where you will find the grand Palazzo Pitti, originally a Medici villa. The palace now exhibits an impressive collection of works by Raphael and Titan. The lovely Boboli Gardens lie just beside the palace. The gardens are exquisitely elegant and adorned with a collection of sculptures including ancient Roman statuary and a lyrical Neptune rising from a watery pool. A magnificent grotto contains several outstanding sculptural works including Michaelangelo's four Slaves and Giambologna's Venus. There are several other palazzi and churches with fine art in Oltrarno, and numerous piazzas. The green Piazza di San Spirito is an especially popular gathering place. Connecting Oltrarno to San Lorenzo is the Ponte Vecchio the only bridge in Florence that survived World War II bombings. Aside from being a venerable landmark, it has many small shops, mostly selling jewelry.